Today we went with the Heavy Haulage & Crane Model club to Hitachi Construction Machinery Europe near Amsterdam. We got a factory tour, a presentation, lunch, overall just a vey good day. The people at Hitachi were very nice and accommodating, and even let us in on a few new models coming up. See, they have an idea here in Europe. Besides producing very good real machines (third largest construction equipment manufacturer in the world), they also plan on producing top quality scale models. The first 1/50th model has already been relaesed. The wheeled ZX170W. A nice model, but that's about it. No steering wheels, and the entire undercarriage is plastic. Also quite expensive at about € 65 euro's ($ 82 USD). Location: Westchester NY "Cortlandt Manor"
Very nice models! I like the 350 I didn't know they still had that model excavator in production. The UHD is 1:40th isn't it? Local 21 Steam fitters FTW! Nope, 1:50th. They are producing an entire new range of models. The 350 is very much in production. We saw about 30 various 350's at the factory today. With different boom and undercarriage configurations. Remko, thanks and great news. We here across the pond appreciate the heads up. Im getting that ZX350! Looks sweet i hope they come out with a regular boom model aswell. They look great! I like the 350lc! I've got plenty of photo's, including from inside the factory, but haven't uploaded them to Photobucket yet. I'll do this coming weekend. Sounds good cant wait to see them! I heard a rumour of a new ZX130-3 being released soon any pictures of that or any hint of it? Great pics.....and thanks for the info, can't wait for that 350LC UHD, the detail looks outstanding even as a pre-production model. Hoping they've got a 650LC or 850LC machine coming too ! Great news, that 350 looks outstanding! I can already see a lot of custom CAT 330DL UHD models coming up next year. The UHD looks very nice! I can already see a lot of custom CAT 330DL UHD models coming up next year. the UHD model looks interesting, but I think it is not made by Universal Hobbies. Look at the missing details and the big ugly aluminium rivets comparing to the very well detailed Universal Hobbies models! Don't forget, this was said to be a pre production model, so the rivets may only be a temporary measure to show the model, not the finished product. Now that I have gone back and looked, looks like the wheeled hoe has the rivets, so my theory may be shot. The wheeled ZX170W is not a nice model. The entire undercarriage is made out of plastic, doesn't have a steering axle, and is way overpriced at € 65 euro's ($ 82 USD). I do not know who the builder is, but they did a crappy job... Too bad, as I would have loved a nice Hitachi wheeled excavator. However, we will meet with the people from Hitachi again soon, and I will bring a couple of models with me to show how it's got to be done, and for a reasonable price as well. They are very open minded about this, so hopefully we will see a better wheeled Hitachi model in the future. UHD is the High Reach trade-mark for the Caterpillar High Reach Demolition line-up, like SLR was used by Hitachi for some time. SLR stands for Super Long Reach. But these machines are not long reach, it is a high reach. 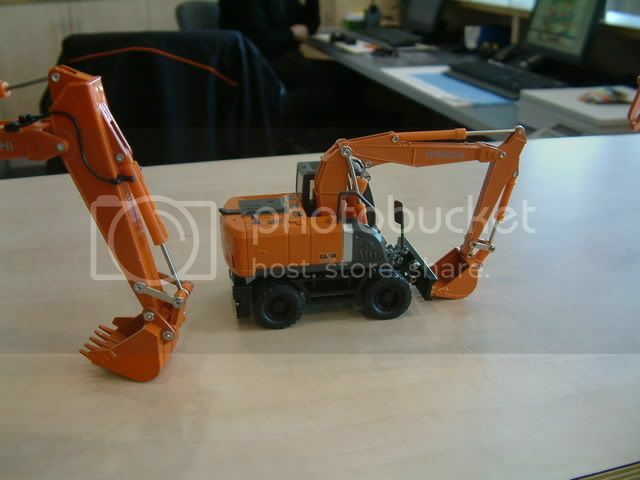 Long reach is used for digging, High Reach is used for demolition. Later they've changed it into SLD (super long demolition). But why not call it what it is!!!! All OEM's call a long reach long reach, a MH is a material handler, etc, etc. But in demolition everything has to be different! It Makes me angry. And about the trade-name UHD; Caterpillar also produces a 325D UHD and even a 320D UHD....; Can anyone tell me what is ULTRA high about that?!! It is a High Reach, but it reaches only 15 or 18mtr, that can not be called Ultra High Reach. 50mtr or more okay, but not use this name for this mini High Reach. It looks and sounds stupid. and if UHD it can only be used on Caterpillar machines. Let this be said.